This is an artist's impression of the biggest and brightest star-birth region seen in the universe to date. The newly identified supercluster contains 1 million ultra-hot stars. Their torrent of ultraviolet radiation illuminates huge placental walls of cold hydrogen gas. For comparison, the nearby Orion Nebula star-birth region contains only four blue-hot stars. The stars in the Lynx galaxy cluster are twice as hot as the brightest stars in the Orion Nebula. 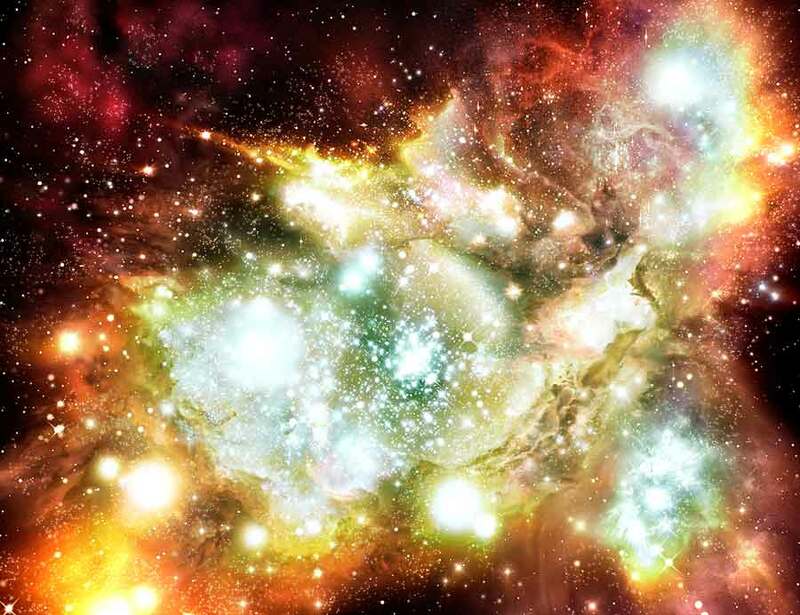 This super star-birth region is a rarely seen example of the early days of the universe where furious firestorms of star birth blazed across the skies. The spectacular cluster's opulence is dimmed when seen from Earth only because it is 12 billion light-years away. The Lynx arc was detected by NASA's Hubble Space Telescope, as a gravitationally magnified smear in light embedded in an image of a relatively nearby galaxy cluster.